When Public Health Seattle-King County inspectors came to call at Skillet Street Food Monday night, they were not amused. The traveling Airstream parked near Safeco Field during the Mariner’s game was unpermitted. What’s more, Skillet was cited for several other red-flag offenses, and when the email alert “Food establishment closures in King County” went out with Skillet’s name on it today, the blogosphere exploded with the news. 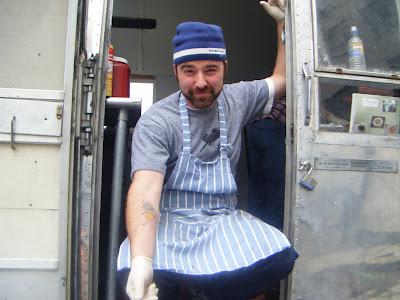 “I wonder,” chef-owner Josh Henderson said, “If a taco truck got shut down, would it be on all the blogs?” Not likely. Take the bullet: this one’s legal. But Skillet ain’t no taco truck, as you know from reading this blog. And perhaps you’ve seen the love given Henderson’s “rock star of a burger” in this month’s Seattle Metropolitan cover-story — and on TV. Or the ink given to the street food-sensation recently in the Stranger. There’s a reason everyone’s crazy for Skillet: the food is superb, and the price is right. So what prompted the alert? Josh Henderson, wearing a cap, a Morton Salt-girl tattoo and sanitary gloves. This isn’t the first time Skillet’s run afoul of the law. “We were shut down when we first started,” said Henderson. The reason? “We were operating a non-permitted trailer.” Now fully permitted, that trailer’s been up-and-running for more than a year, tracked down by fans all over town and making the national press sit up and beg for bacon jam. You’d have thought he’d learned his lesson the first time, but apparently not. Henderson sounded pretty glum today knowing that Skillet’s reputation is being scarred by this week’s health-department call-out. He’s concerned about the visibility of the red-flag issues cited, including the potentially hazardous foods at unsafe temperatures (“we were holding them on ice”) and the unavailability of hot water: things that would make many customers see red, too. “I don’t fault the health department,” Henderson said. “It was our decision, our choice and unfortunately we made a wrong one.” But he does feel uncomfortable knowing that the health department’s closure alert remains online and “Skillet closed” may be the first thing potential diners see when they Google his business in hope of tracking down the famous Airstream. “We actually voluntarily closed [the unpermitted trailer]. We shut down for the evening when they came by. But none of that stuff gets talked about. 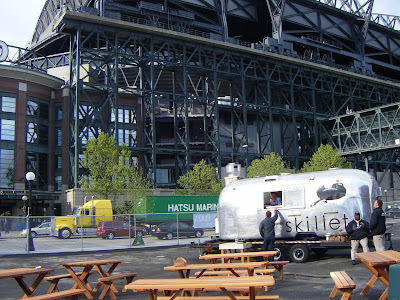 Tonight, with the blessing of Public Health Seattle-King County, Skillet is serving street food outside Safeco Field from 5 p.m. till first pitch, and they’ll be there Sunday afternoon (throwing over their regular gig in West Seattle). You can follow Skillet via their Website, but hopefully not via this one.